FILE: A black market foreign currency dealer displays the new $1 million banknote worth $7 on the streets of Harare, October 6, 2008. HARARE (Reuters) - Less than a decade after hyperinflation obliterated Zimbabwe’s dollar along with its pensions and savings, the southern African nation is suffering a return to precipitous price rises. Zimbabwe adopted the U.S. dollar in 2009, along with Britain’s pound and the South African rand, to tame inflation that topped out at 500 billion percent. But the relative financial stability of the last eight years has unravelled in the last two months as acute foreign exchange shortages have led to sharp price increases. Meanwhile money in banks is losing value fast. The situation is still a far cry from 2008 when the central bank printed a Zimbabwe $100 trillion note. But Steve Hanke, an economics professor at Johns Hopkins University in the United States, said in paper published this week that hyperinflation - defined as monthly inflation above 50 percent for at least 30 consecutive days - had returned. Zimbabwe’s real inflation rate, measured by purchasing power parity and taking into account its de facto exchange rate, was 313 percent a year and 112 percent on a monthly basis, said Hanke, who has written a book about the country’s 2008 crisis. “Its purveyors should be incarcerated and the keys should be thrown away,” he concluded, taking a swipe at the government of 93-year-old President Robert Mugabe. Other economists said Hanke’s figures might be a bit steep but also dismissed the official numbers as fantasy. University of Zimbabwe economist Tony Hawkins said an increase in money supply through massive treasury bill issuance this year and depreciation of the domestic currency pointed to inflation as high as 40 percent or more in the next two years. Locally-based Econometer Global Capital put the September inflation figure at 65 percent. However, Mutasa Dzinotizei, who heads the Zimstats statistics agency, dismissed the alternative calculations. His organisation’s methodology, based on domestic dollars taken at face value, was sound, he told Reuters. “Inflation is reflected at the retail end of the market. We don’t go to the stock exchange or look at the exchange rate. I have never seen it done anywhere in this world,” he said. Aside from locally-produced staples such as maize meal and bread, prices of imported goods on Harare supermarket shelves have shot up 30-150 percent in the last two months. Importers attribute the increases to the price of foreign exchange, which they have to buy on the black market at a premium. 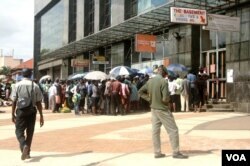 Assessing the true value of U.S. dollar balances in Harare banks, known locally as “zollars”, is difficult but on the black market they were trading at a 65 percent discount to cash this week. Economists including Hanke have used another gauge of value from the old hyperinflation days - the Old Mutual Implied Rate - to try to measure the extent and pace of Zimbabwe’s financial collapse. The Old Mutual rate, based on the relative values of shares in insurance firm Old Mutual in Harare and London, suggested a discount of as much as 80 percent this week after the Harare shares hit $14.29 compared with $2.44 in London. In effect, this means $100 in a bank in Harare is actually worth less than $20. With Zimbabweans piling into any asset they think might retain value, virtual currencies such as Bitcoin have soared. On the local bitcoin exchange, Golix (golix.io), bitcoins were at $9,800 compared with a spot rate of $5,820. “There is far greater demand for bitcoin in Zimbabwe than supply because people see bitcoin as a store of value for their money in the bank,” one Harare Bitcoin trader said.